Let's talk truth. The truth is simple and blunt: we live in a broken world. Open the news, and you will find trouble upon trouble upon trouble. And us, humans, we pride ourselves on the ability to fix these problems. We invent and discover and search to find answers to these problems, yet every so often we are confronted with another bleak truth: We are not in control. People often describe cancer as a death sentence. In the same league, hepatitis, MS, Alzheimer's, and AIDS taunt us in our helplessness. "There's nothing you can do about them. Not much anyways. They remind you in the cruelest of ways that You're not in control. You are helpless." If we're honest, we despise the feeling of being helpless. Because of our aversion to helplessness, we struggle with the idea of an eternal and all-powerful being who is anything but helpless, who has the power, and is willing to fix all the problems that we cannot. On one hand, we challenge Him, fist raised, demanding for Him to amaze us. And on the other end of that, somehow, believing in God might as well be throwing up the ultimate white flag. According to the Merriam-Webster dictionary, a miracle is "an extraordinary event manifesting divine intervention in human affairs." According to Baker Encyclopedia of the Bible (1998), a miracle is an "event which may seem contrary to nature and which signifies an act in which God reveals himself to man." The Bible records more than 124 miracles, including all of the healing done by God. The creation of the world, as described in the book of Genesis, is probably the first miracle recorded in the Bible. God created the universe out of nothing. The Bible continues to record miracle after miracle all by the hand of God in the lives of humankind. Some of the well known miracles recorded in the Old Testament include the ten plagues of Egypt, God's provision of drinking water pouring from a rock, a bread-ish substance raining from the sky along with protein for the Israelites in the wilderness, the wall of Jericho falling down as they marched around it, the healing of Naaman from deadly leprosy, protection of Daniel from a pit of hangry lions, Shadrach, Meshach, and Abednego exiting an inferno untouched, and many, MANY more. In the New Testament, miracles accompanied the ministry of Jesus during His time on earth and that of His disciples and the early Church following His ascension into heaven. Jesus even raised people from the dead! Some describe miracles as "seals of a divine mission." Miracles, or signs and wonders, accompany the ministry of the people of God. Miracles accompanied the work of the judges of Israel. Miracles accompanied the messages of prophets. Miracles accompanied Jesus' ministry. Miracles also accompanied the disciples' ministry and the growth of the Church. Signs and wonders are just that: proof of a God who is powerful and willing to intervene in the lives of mortals. 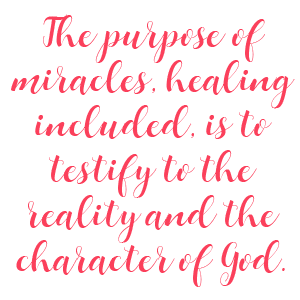 The purpose of miracles, healing included, is to testify to the reality and the character of God. In the event of the Exodus, the Lord stated, "The Egyptians shall know that I am the LORD, when I stretch out My hand on Egypt and bring out the sons of Israel from their midst" (Exodus 7:5). While healings and miracles happen to fill an immediate need, they point to the existence of a powerful and loving God. People who witnessed the miracles performed by Jesus had a choice as to how they would respond to the proof of God that was presented to them in wonderful and very tangible ways. One of my favorite miracle stories is found in Mark 2:1-12. A group of friends decided that their paralyzed pal needed to see Jesus, and they used some pretty out-of-the-box methods to get their friend in front of Jesus while He was surrounded by a vast crowd. When Jesus saw the paralyzed man, His response was not to immediately heal the man. His first response was to say, "Son, your sins are forgiven." Here, Jesus presented His ability and his mission of restoring and making right the ultimate cancerous killer of humans: sin. Then Jesus told the man to get up and go home. Jesus had a holistic view of His mission. He wasn't only there to fix physical problems. He was also there to fix the eternal problem. Jesus' ability to heal the man points to a power that is able to forgive sins; it pointed people to a God who is compassionate and a God who wants to restore them to right relationship with Him. Today's age of Science and Technology has led some people to rule out miracles categorizing them as an "outmoded and impossible concept." Yet, we continue to hear stories of miraculous works and healings. Can a modern citizen of the world believe in such things as miracles? The idea that miracles are outmoded and impossible is a philosophical assumption, not a scientific conclusion. Scientific conclusions require investigation. What if, at the end of that investigation, humans found themselves confronted with a powerful and loving God? Like the crowd in the Mark passage, when we encounter the wonder of God, we have a choice. 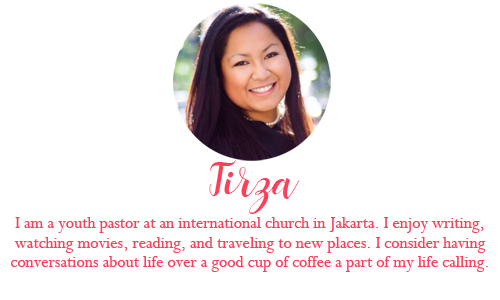 Will we concede to His God-ness (and our not-ness) and enter into a wonder-filled relationship with a powerful and loving God, or will we ignore him and walk away?